On Horsepower TV a while back they did a suspension upgrade on a gbody wagon "Sucker Punch." In the front they used the Ridetech Tru turn coilovers with beltech 2 inch drop spindles. Im currently working on this similar project and want to know what is the difference to adjusting the spring on the coilovers to get the stance? To leaving the coilovers alone and lowering the car with the 2 inch drop spindles? I noticed you had the stock spindles and I was planning to do the same. Ask scot w or chalrief1. I think Charlie is kinda chilling out though. Scot is the guy to listen to when he chimes in. Thanks for the info again Scott! Always appreciate your feedback. Thank you so much for creating this "how-to". It came in handy last couple of weeks as I got the whole Ridetech suspension installed on my GN. couple of questions, If I occasionally drag the car how much do you sacrifice 60 foot with these street car performance set ups and can I get the springs in black instead of blue? If there much of a difference in the UMI versus DSE? Also any package deals If I buy the whole package at once? HR rear sway still best one or is the DSE "just as good"
Anyone here happen to have coilovers installed with the RJC 3in crossover exhaust? I've got mine installed and about to replace this flowmaster thing. 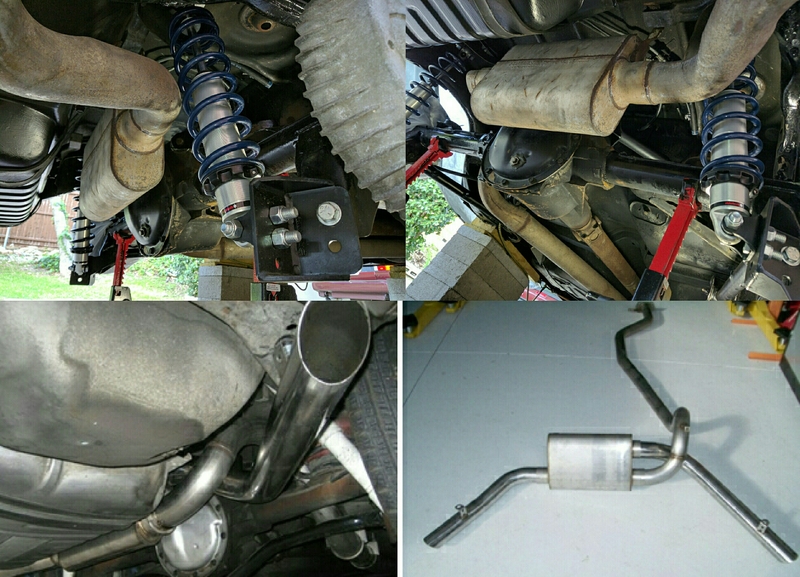 I'm wondering about the clearance I'll have because adjusting the muffler inlet pipe and tailpipe may limit what I can do as far as clearance for the shocks. Plus I'm a major n00b so... Here's some pics. The ones on top are what I've got now and the bottom is what I want. Any info/advice would be much appreciated. had ride tech and roc on my car no clearance issues. cool thanks. did you do the install yourself? yup i did, wasn't bad at all. can't remember, didn't have any problems everything bolted right up, i did have to get factory hangers they were gone when i got the car. I installed this exact setup in my '87 GN and it drives like a whole new car... and I love the ride height. I had a few questions and Scot was more than helpful. Thanks again Scot! You are more than Welcome! Car looks Great BTW! Scot, I know the Tru Turn helps with tire clearance and says a 275 tire will fit but I am assuming that this is on a 18” wheel. A 235 on a 15” wheel is pretty much the max for the front without rubbing. Would you be able to run a wider tire (than a 235) on the front with the Tru Turn with the stock GN wheels? Also I know you sold it but your car looks amazing in these posts. The Tru-Turn doesn't really help with the tire clearance as much as the "Muscle Bar" does. The muscle bar has flat ends on it and hugs the front frame to help fit the larger front tire... But to answer your question, it's YES, The trick is to stay right at a 25'' tall tire or Below and you shouldn't have rubbing issues.